The Adventure Park has added another trail to the multitude it already offers. This one - is mostly zip lines for those who just can't get enough zip lines! (PRLEAP.COM) The Adventure Park at Virginia Aquarium, the popular outdoor zip line and climbing venue located at 801 General Booth Boulevard in Virginia Beach, is zipping into its 2019 season of zip line and climbing fun, currently on its spring schedule. The Park will also extend its hours during the school spring break. New for the 2019 Season is "Grand Rapids" - the thrilling, mostly-zip-lines aerial trail for those who can't get enough zip line fun. Grand Rapids was added to all the other aerial trails at the Park just a month or so ago and is included in the regular 3-hour ticket. The Adventure Park is the largest of its kind in the area. For further details and updates please visit www.VirginiaBeachTrees.com, email Info@VirginiaBeachTrees.com or call (757) 385-4947. Facebook: @VirginiaBeachTrees. 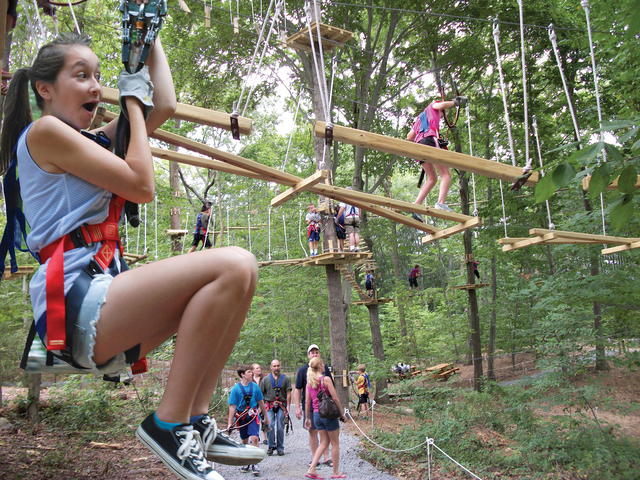 The Adventure Park at Virginia Aquarium is designed, built and operated by Outdoor Ventures. For further details and updates please visit www.VirginiaBeachTrees.com, email Info@VirginiaBeachTrees.com or call (757) 385-4947. Facebook: @VirginiaBeachTrees.